Noe was nursing a hangover, so we decided to stay close today. The plan is to walk around the French colonial section of Thakhek, then do the cave circuit just outside of town heading east along Road 12. We’ll see where the afternoon takes us after that. Oh, and it’s New Year’s Day (Pi Mai), so Sabaidee 2560! And Happy Easter! 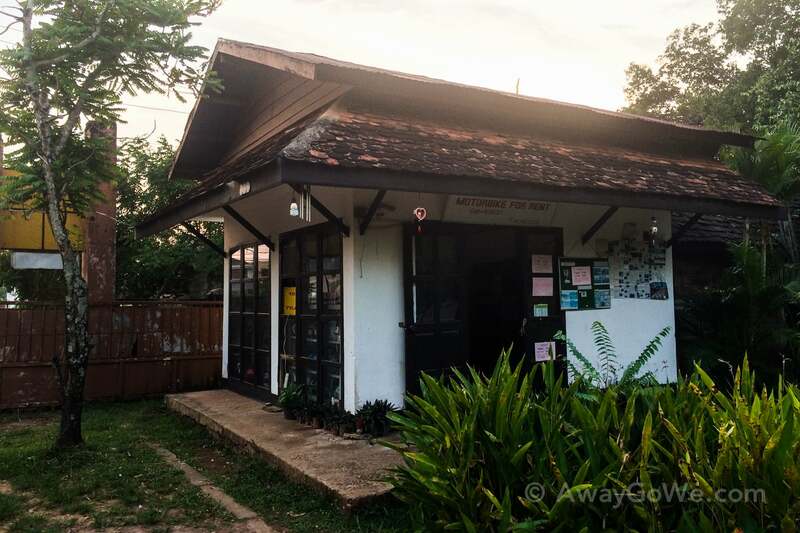 We stayed a couple of nights in Thakhek in 2012, at the beginning and end of our motorbiking adventure around ‘The Loop,’ but stayed a bit out of the center of town at Thakhek Travel Lodge, which catered to travelers attempting the Loop. We did explore downtown a bit (it was a long walk!) but are looking forward to seeing more. Downtown Thakhek conjures up what downtown Vientiane might have looked like 50 years ago…or maybe just a couple of decades ago, to be honest. We’re staying right smack in the center of town this time, at Inthira Thakhek, which may not have been the smartest move over Pi Mai, but the place itself is great. As you can tell, I wanted to get a bit more mileage out of my amazing Pi Mai shirt before changing into hiking clothes later on, as I don’t know when it will be socially acceptable to wear my shirt again. Oh, let’s be honest, I’ll be breaking this shirt out every weekend until Lori makes me burn it. Seems that Ms. Noy’s got some competition. Lori picked our accommodation this weekend in Thakhek, and did a pretty bang up job on both accounts. While a bit upmarket than what we’re used to, there aren’t a ton of options in downtown Thakhek, and prices don’t vary much. We quickly realized that Inthira is the place to stay in the town center, and for good reason. It’s got a ton of charm, the staff is friendly and attentive, it’s got an awesome open restaurant that takes up the entire first floor, and the rooms are well appointed with a lot of character. It actually reminded us a lot of Hotel San Miguel Arcangel where we stayed in Izamal Mexico, and not just because they both happen to be yellow. The staircase to reach all of the rooms was something between stairs and a ladder — may not be accessible for everyone, so keep that in mind (it’s steeper than it looks!) Thankfully, they carried all of our luggage up to our room for us, which isn’t uncommon in Laos, but particularly appreciated this time. We stayed two nights — the first was spent in one of their nicer rooms fronting the road with a balcony. We would have stayed both nights in this room if it hadn’t been for the ear-bleeding music coming from gigantic speakers across the street pointed directly at our room. Thankfully, they had a vacant room on the top floor in the back of the hotel, where you couldn’t hear much of anything. We should have known better with our previous experiences with Lao festivals and holidays, but really wanted that balcony, mainly for after Noe goes down around 7pm. Additionally, the first room had a pretty wimpy air conditioner and these were some of the hottest nights we had experienced to date in Laos. Thankfully, the second room’s AC was amazing, so it all worked out in the end. I have no qualms about recommending this place to others, even over Pi Mai — but be forewarned, if you do come to Thakhek during Pi Mai, make sure you get one of the rear rooms. After walking around downtown (and getting thoroughly drenched — not from Pi Mai revelers (it was legally too early for water fights to commence) but from the sweltering heat and humidity), we were ready for some caves! That, I’ll save for our next post, so stay tuned! On our way back from the caves, we took a slight detour south of town to the That Sikhottabong, one of the most significant stupas in Laos. And what better day to visit than on Pi Mai! One of the customs on Pi Mai is washing the Buddhas, which essentially means showering Buddha images and holy sites with water. Many Lao people use Chrysanthemum water, which can easily be mistaken for Gatorade, if you’re not careful. It’s commonly believed that the water fights we’ve seen in the streets are derived from this long-held practice of washing the Buddhas, and together constitute Laos’ Water Festival. After leaving the stupa, we had one important stop to make before locking ourselves (and our child) safely inside the confines of the hotel before the real party started. We made a small pilgrimage back to where our motorbiking trip began and ended: Thakhek Travel Lodge. Mr. Bird has replaced Mr. Ku, and apparently his hand-written map has also been updated. One thing we were very happy to see still around were the old Log Books, every single one dating back to the mid-2000s when they started the tradition. We looked through the Log Book covering our stay, but sadly it appeared we hadn’t left a message. Intent on changing that, Lori added one in the 2017 book. Nonetheless, it was fun re-reading the accounts that we had read in preparation for our journey. We also read some very recent accounts, which didn’t seem so exciting now that the road is completely paved. A quick photo in front of our old room…well one of them, anyways. We stayed in #8 the first time, but it was bloody hot!!! It had a ceiling fan that was useless given that the mosquito net over the bed had a solid roof — one of the hottest nights of our trip. We vowed we’d never stay in #8 again and asked for another room when we returned from the Loop. They gave us #7, which was only marginally cooler, but still pretty darn hot. But none of this was unusual on our backpacking trip in Asia. We rarely had AC then. Now, you can get an AC for just a few bucks more at most places, it seems. Noe, taking it all in as usual. Mr. Ku’s old hideout, where, in 2012, I handed over my passport in exchange for a 110cc beast that some how got us back to this very spot four days later without issue. Everyone had to prove to Mr. Ku that they were worthy of taking his bikes out on some of the most rugged roads Laos had to offer by performing the crazy feat of riding from here to the street and back without falling. Needless to say, many a motor biker came back bruised and battered. I had my motorcycle endorsement and owned a couple of bikes a few years back, and perhaps unsurprisingly didn’t find the task challenging. But there was a monumental difference between this bumpy driveway and stretches of the actual Loop that we had no way of knowing at the time. Looking back now, it’s a minor miracle that so many made it back in one piece. However, this little stretch is now rougher than 99% of the route today. I leave you with the party raging outside of our hotel into the wee hours. All who transited past got thoroughly drenched. I’m not sure how we made it across virtually unscathed. Maybe it was the baby. Maybe they took pity on us. Someday, when Noe’s older, it would be fun to return to partake in more of the festivities…maybe. On second thought…maybe not. Love the picture of the 3 of you! Thanks! Photos of all 3 of us are a rarity! Such happy adventures for your little family! Thanks! We are having great fun! Noe’s newest fascination is watching the dogs wander around the ecolodge we are visiting this weekend—it makes him laugh! So jealous—wish we had traveled more with the boys when they were younger!! We started visiting other countries once they were ten or older, and your site is showing others that it can be done earlier on. Keep the great stories and pictures coming; we so look forward to seeing them in our mailbox!! Thank you! Traveling with our little one is worth the effort. He provides a gateway into interactions that we couldn’t have when we traveled as just a couple. We’ll keep the posts coming; thanks for reading! Love the bright colors of the town! And pics on Noe, of course!